The shrugs are one of the most effective ways to train your traps muscles. They force the trapezius muscles to do one of their main function to lift shoulders up. 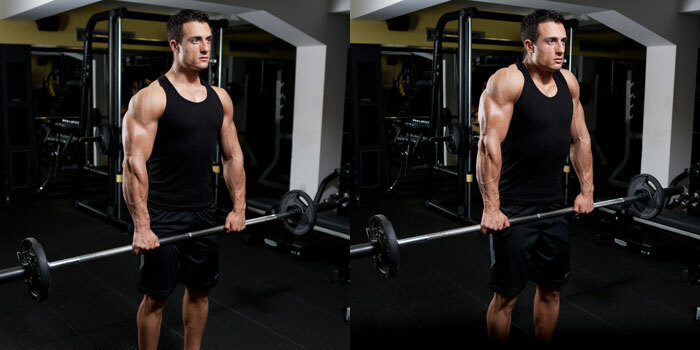 The barbell shrugs are the most basic variation of the shrugs which allows to put some serious load on the traps. Put the barbell in squat rack and loaded it with the desired weight. Grasp the bar with overhand grip (palms toward your body and hands slightly wider than shoulder width) and stand upright with your feet about 20-25 cm. apart. Keep your knees slightly flexed, back straight and the bar right in front of your body. Slowly let your shoulders to go down just a little bit below their usual height and inhale. Then raise them up as far as you can and hold the peak contraction at the top for 2 seconds as you exhale. Return the weight back to the starting position in a controlled manner and begin the next repetition.